Through Blueprint for Wellness, a program offered by Quest Diagnostics, employers can provide a way to keep their employees informed about their health. Employers can gain deeper insight into how employees can achieve better health outcomes, how to achieve greater linkage with health partners and more effective ways to engage employees with Blueprint for Wellness services. This program helps employers achieve measurable improvement in employee health, productivity and health care costs. Depending on the type of program the employer selects, the visit will include biometric and lab-based screenings that can be integrated with employees’ self-reported lifestyle habits and health information to reveal powerful insights. The screening takes about 15 minutes from the point of check-in to completion. It includes a blood draw for many different blood tests; this blood draw can be from your arm (venipuncture) or from a fingerstick and is dependent on the panel the employer selected. Biometrics include height, weight, blood pressure, and hip-to-waist ratio. The Health Risk Assessment questionnaire is online and provides data related to health, diagnosed conditions, family history and lifestyle choices. 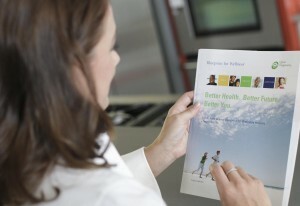 One of Blueprint for Wellness’ clients, Lafarge, has found this program to be a great benefit to their employees. After employees received their results, they felt empowered to change their lifestyle habits. Watch their testimonial here. Next post: What’s new for ExamOne in 2014?